Over the years I've discovered some great books by following authors who blog. 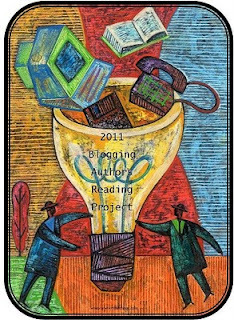 I follow quite a number of group author blogs as well as individual authors. Last year Florinda of 3r's came up with an excellent project and I'm going to continue the project for 2011. One of the rules last year was you could only read those books by authors you already had in your stacks. I'm amending that rule for this year since I frequently stumble upon an author and want to read their books. The goal is simple - to read books by authors who blog. I'll be starting with the books I already have in the stacks since one of my goals this year is to whittle down my current TBR pile. Michelle Davidson Argyle of The Innocent Flower - debut novel "Cinders"
Richard Doetsch's - "The 13th Hour"
Diane Emley - "The First Out"
Karen Harrington's of Scobberlotch - "Janeology "
Jody Hedlund's debut novel "The Preacher's Bride"
Kait Nolan's - "Forsaken by Shadow"
Diana Rowland - "Secrets of the Demons"
John Scalzi's of Whatever - "Old Man's War"
K.M. Weiland's of Wordplay - "A Man Called Outlaw"
I've been following for a while and working my way slowly through their books. From the Murderati Group blog of 14 mystery writers including Pari Noskin Taichert, Alafair Burke, Allison Brennan, Brett Battles, Cornelia Read, J.D. Rhoades, J.T. Ellison, Louise Ure, Robert Gregory Brown, Zoe Sharp, Toni McGee Causey, Stephen Jay Schwartz, Alex Sokoloff and Tess Gerritsen. Wonderful blog. If you haven't been following them, you should. So far, I've read stories by Toni McGee Causey, Louise Ure, J.D. Rhoades, Tess Gerritsen, Robert Gregory Browne, J.T. Ellison, and Allison Brennan. From the former blogging group Running with Quills with 7 great romance suspense authors including Susan Anderson, Stella Cameron, Kate Douglas, Lori Foster, Jayne Ann Krentz, Elizabeth Lowell and Carla Neggers. I've read stories by Susan Anderson, Lori Foster, Elizabeth Lowell, Jayne Ann Krentz and Carla Neggers so far. They shut down to follow their own individual interests and most are on facebook. I'm going to continue to read their books. These are just a few of the blogging authors whose books I have on the shelves. Which blogging authors are you following? I'm honored to be on the list. I hope you enjoy Outlaw! Oh -- what a great list! I need to check out these blogs. But will my wish list grow too big? I'm so happy to be on your list. And there are some other great ones on there I need to check out. Thank you!